White and Blue Blog for a True Greece Experience: A luxurious step into the past! A luxurious step into the past! Surrounded by a typical Mediterranean setting, Kinsterna Boutique Hotel is a historical mansion converted to offer excellent accommodation all year round. Boasting a superb location right at the foot of the mountain, nestled amidst idyllic vineyards, olive groves and citrus trees, this unique property is a nature lover's paradise. Thanks to its blessed location, Kinsterna features easy access to the mountainous areas as well as the Mytroan Sea, where guests can soak up that all important sun, sea and sand! 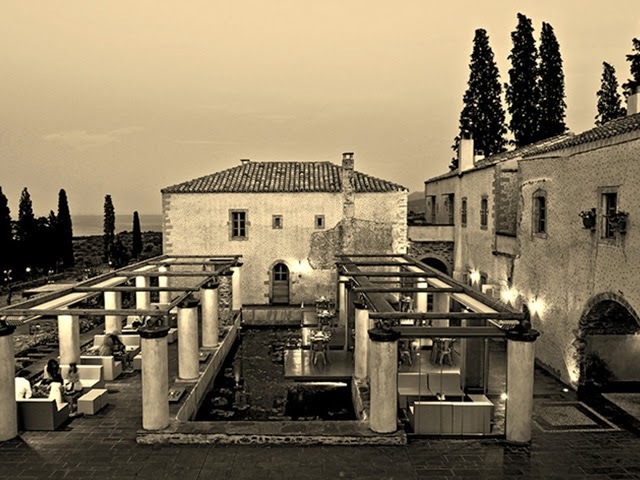 However, apart from its fantastic neighboring areas, Kinsterna itself is a unique choice for your relaxing getaway in Monemvasia, the famous fortified town of southern Greece. The mansion consists of luxurious rooms, suites and residencies featuring rich wooden floors, walls made of stone and stunning views, creating a sumptuous setting with a traditional aura. In this exact piece of heaven on earth, guests can do much more than just savoring the authentic beauty of the mansion. For a hands-on encounter with the southern Mediterranean lifestyle you can help us make our wine, collect herbs or pick olives right on the estate. All in all, Kinsterna has been carefully designed for your absolute pampering in a place overflowing with old-world charm!